What did medieval monks wear? What was the significance of the colors of their clothes? The color of the habits, the name for the clothes of the Medieval monks, varied according to their order. The earliest Benedictine monks wore wore clothing consisting of white or grey habits which were the colors of un-dyed wool. However as time went by black became the the prevailing color of their clothes hence the term "Black Monks" has come to signify a Benedictine Monk. The Cistercian and Carthusian orders of Medieval monks adhered to even stricter rules than the Benedictines and wore undyed wool for their monks clothes to proclaim their poverty. Their habits, or monks clothes, were generally a greyish-white, and sometimes brown. 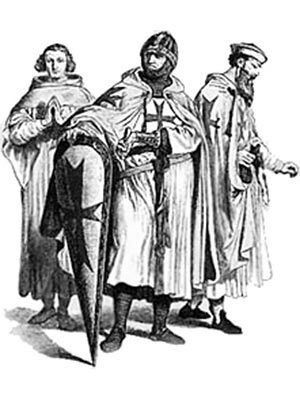 The Cistercian monks were referred to as the "White Monks". Each section of this Middle Ages website addresses all topics and provides interesting facts and information about the clothes and fashion in bygone Medieval times including Monks Clothes in the Middle Ages. The Sitemap provides full details of all of the information and facts provided about the fascinating subject of the Middle Ages!